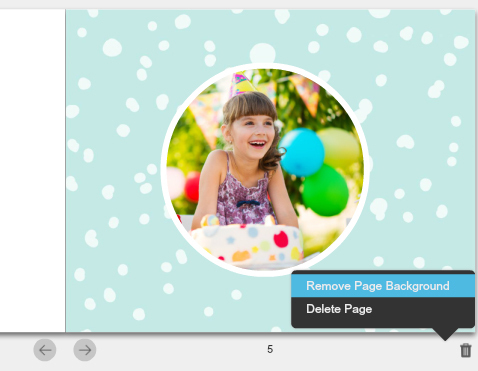 Adding backgrounds to a page is easy in Picaboo. You can decide to use one of your own photos, you can choose from the thousands of backgrounds we have available through the software, or sometimes just a simple color is all you need. Simply click on the page you want to add a background to, then you can either drag a photo to the page from your photos in the Media Tray, or you can click on Backgrounds in the Editing Toolbar. The backgrounds sidebar will open to the left of the project. 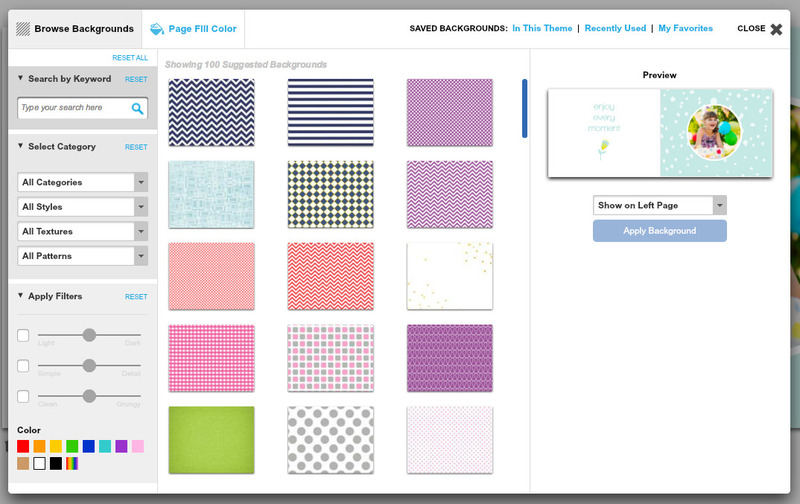 You'll see some selections here, but you can also click on Find More Backgrounds to search through more. You'll see more options listed at the top: Browse Backgrounds, Page Fill Color, In This Theme, Recently Used, and Favorites. In this Theme displays all backgrounds that belong to the theme that was selected when the project was created. Recently Used will show the most recently used selections. My Favorites is a list of the backgrounds you've marked as a favorite. When you're hovrering your mouse over a background in the sidebar, you'll see two small icons in the lower part of the background. A Magnifier, and a Heart icon. Click on the Heart icon to designate it as a Favorite. In addition to these options, you'll also see that you can Filter Backgrounds based on Keywords, Categories, Styles, Textures, Patterns, Colors, or even filters such as Light/Dark, Simple/Detail, or Clean/Grungy. You'll notice a Preview area to the right that shows what your page(s) will look like with the selected background. You can change the selection here to Preview how the background will look on the left page, right page, both pages, or even apply a selected background to all pages in the book at once. 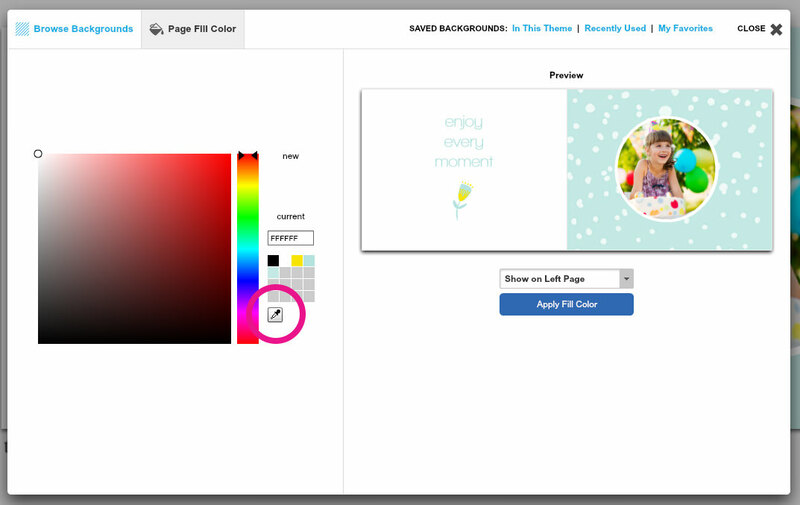 When you select the Page Fill Color option, you'll see a color palette. From here you will have the opportunity to select from a rainbow of colors and hues. Once you pick a color from the large color display, that color is displayed under the New box. Click Okay to apply this selection to your page. The last several colors created are displayed in that small grid on the right side. If you are looking to repeat a color that you've used before, that is the simplest way to find it. There is also an Eyedropper Tool that you can use to choose a color from the one of your images in your project. Simply click the Eyedropper, and the palette will drop away to allow you to choose a color from the page. Once you click on a color of your choice, the palette box will return, and your newly picked color will be under the New color choice in the upper right. Click okay to apply the new color to your background. Deleting a background is an easy task as well. 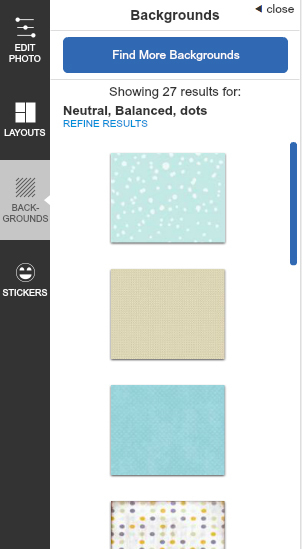 Backgrounds can be removed by simply swapping them out with another background, or choosing a color such as white. Another option is to click on the background, click the trashcan button in the lower corner of the page, then select Remove Page Background. Pressing the Delete button on your keyboard while the page is selected will do the trick as well.